Back when Saratoga raced 24 days, each of its four weekend Saturdays was marked by a Grade 1 stakes race. Sundays were dark days. The Whitney came first, then the Alabama, followed by the Travers and, ultimately, the Hopeful. For many horse racing fans, the Alabama Stakes was as meaningful as the Midsummer Derby. What was great about this Alabama was that no filly ducked other fillies that had a claim to being the best of the generation. Blind Luck made the trans-continental trip to New York from her base in California and proved that she alone, until Devil May Care has another chance at her, is tops among the female sophomores. How long have people wanted Zenyatta to prove her superiority, and vice versa for Rachel Alexandra? Devil May Care’s downfall shouldn’t be taken as anything to be ashamed of. But her defeat did deny jockey John R. Velazquez from riding a half dozen winners. With Saratoga’s jockey colony depleted of several accomplished riders that headed west to Chicago for the Arlington Million Day, Velazquez strung four winners back-to-back in races two through five and piloted a fifth, Dogwood Stable’s front-running Zapster, to triumph in the ninth. There has been a distinct speed bias to the turf courses for several days because Saratoga hasn’t seen rain in awhile. That will change Sunday for two reasons: a downpour causing power outages hit at 4:23 am and the premium for patrons with paid admission is an umbrella. This is how synchronicity works. Scratched from Thursday’s West Point Stakes, Flying Zee Stable’s Writingonthewall, a five-year-old gelding, led wire to wire in the first race and had the stamina to hold on despite racing only seven days earlier. In the wake of his dusty kickback, neither Pretty Boy Freud nor Good Prospect, the favorite, could catch him. Velazquez began his streak aboard Edward P. Evans’s Curlinello, a rangy, long-striding son of Smart Strike. Saturday’s second race was the two-year-old’s first outing and he ran like a colt in search of experience. As his races get longer, he should relish his virtue of patience. Curlinello took his time to get in gear. But when he did, he lumbered up on the outside to catch Joe Vann. He and Joe Vann, the second horse, are trained by Todd Pletcher and created the $36 exacta. In the eighth race, J.B.’s Thunder, owned by Columbine Stable, was a nifty winner for Al Stall, Jr. Rider Shaun Bridgmohan had difficulty keeping his mount’s enthusiasm in check as J.B.’s Thunder broke out of the post parade and went sightseeing on the backstretch while his opponents kept walking. A good portion of the large crowd of 30,852 devoted its attention between races looking at the simulcast television sets. Those focused on Arlington Park saw the Arlington Million go to Debussy. In the evening, the Philadelphia Orchestra ended its summer residency at SPAC with Tchaikovsky. 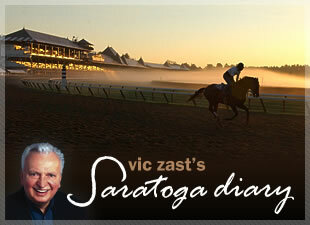 Vic Zast has attended the races at Saratoga at least one day each summer for 47 years. He writes a column for HorseRaceInsider.com that appears online each Monday.